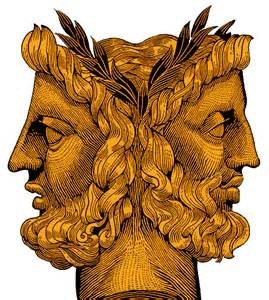 Lately I have encountered several people in my life who are Janus-faced. It’s been kinda strange. I was having a conversation with a buddy about it, and found that he has been encountering some of the same thing. A small phenomenon, or a coincidence? Yeshua said that before the end of the age, because of the ‘growth’ of the breaking of Torah [iniquity is defined in scripture as going against His Torah, His code of ‘tzedaka,’ or ‘righteousness,’ ] the love of most people will become cold. It is the ‘growth’ part that I am thinking about, or the gradual process of people’s hearts in general getting ‘colder’ over a period of time due to the lack of the commandments of G-d. I’m not exactly young, and while people in my youth were not the kindest and most loving generation, I yet have observed that people are indeed getting colder of heart since then. I think that is part of this Janus-faced phenomenon. People do not want to be ‘seen’ as having a cold heart, so they put up a false ‘face,’ making pretense toward kindness, but ‘turn’ when they are not in your presence. They must not realize that their actions betray the other ‘face,’ which is the real self. This is usually a judgmental self, one that is quick to work off of assumption, without giving another human the grace of Messiah. They ‘justify’ their duplicity by their assumptions about the other person. First impressions are not always correct! And assumptions are, many times, wrong! I think one reason I am on the wrong end of this stick a lot these days is because of my tzit-tziyot and kippah: many ‘assume’ that I am an orthodox Jew! Or that I am a ‘legalistic,’ judgmental person, simply because I wear certain outer garments. Many of my former ‘christian’ friends assume that I have ‘turned away from grace,’ because they do not understand why I keep Torah. They misread a few verses and assume that I think I’m saved by doing so. No, I do so because I’m saved, and I believe in obedience. To G-d; not man. Last week, I was thinking about all of this, and Nataniel came to mind. I mentioned this briefly in my drash on Shabbat. He was declared by Yeshua to be a ‘true’ Yisra’eli [Israelite], and to have no ‘guile’ in him. Guile is deceit, two-facedness. When I was thinking about it, I prayed that Abba would remove any guile from me. I think I strive to be ‘up-front’ and genuine to everyone. And friendly; kind. But my wounds of the past do make me more guarded. And I’ve always been a mite shy, anyway. This, I think, comes off differently to others. I therefore have asked Messiah to help me to give trust first, and not be offended if it is not returned. Even by the Janus-faced crowd. But perhaps another might stop hiding behind false kindness, if they see zero guile in me? The oil of anointing was very sweet smelling, mixed with very pleasing spices [Ex 30:23-25]; and it was put all through the tabernacle [this is the ‘picture’ being painted in 133], making the people and the place most pleasant to the sense of smell. We have a ceremony evoking this idea at the end of every Shabbat. I long for this among brethren. And the good thing is that I see it among our Congregation, like never before. And this whole thing just makes me ‘hope’ and anticipate the day when there will be no guile in anyone, when all those who actually are the brothers of Messiah will live ‘gam yakhad’ in His Kingdom. Next ›Salvation in the “old testament,” and the role of the sacrifices and commands in our lives….